The killing of civilians in Juba, South Sudan in mid-December set the stage for the civil war that has torn the country apart over the last five months. Although the intentions behind the outbreak of violence on the 15th of December still remain unclear, what is known is that for at least three days after the first shots were fired in the military barracks in Juba, civilians from the Nuer tribe were targeted and killed throughout the capital city. These ethnic killings became the justification for the current resistance movement lead by ex-vice president Dr. Riek Machar against the government of President Salva Kiir. A month after the killings in Juba first began, the streets of Mia Saba in Munuki West, a Nuer neighborhood, were still vacant. It was not just the streets that lacked any sign of life, but that th ehouses stood as gutted shells, their contents strewn across the ground – burnt remnants of a community that no longer existed. 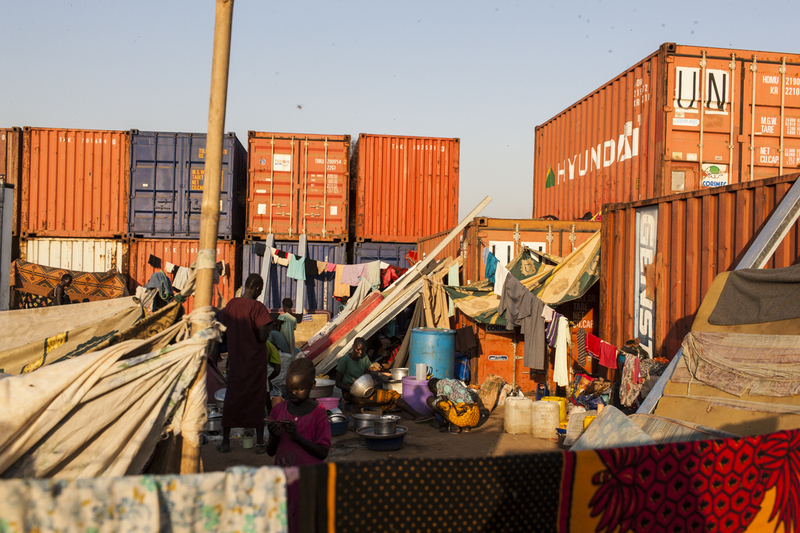 Just across the road from a neighbourhood that was invaded by Dinka soldiers on 16 December, 25,000 people from the Nuer tribe continue to seek refuge at an IDP camp inside the UN base in Tong Ping. I sat with members of the community in the camp as they drew maps and discussed the locations where they had witnessed destruction and mass killings in their neighborhood of Mia Saba. I was warned about going to the area, as the Sudan People’s Liberation Army (SPLA) and the forces of President Salva Kiir still mingled amongst the rubble and wandered from house to house. I targeted two specific locations in Mia Saba after receiving multiple reports of a mass killing in a tukul, or traditional home made of mud, and of a house that had been burned by government forces. 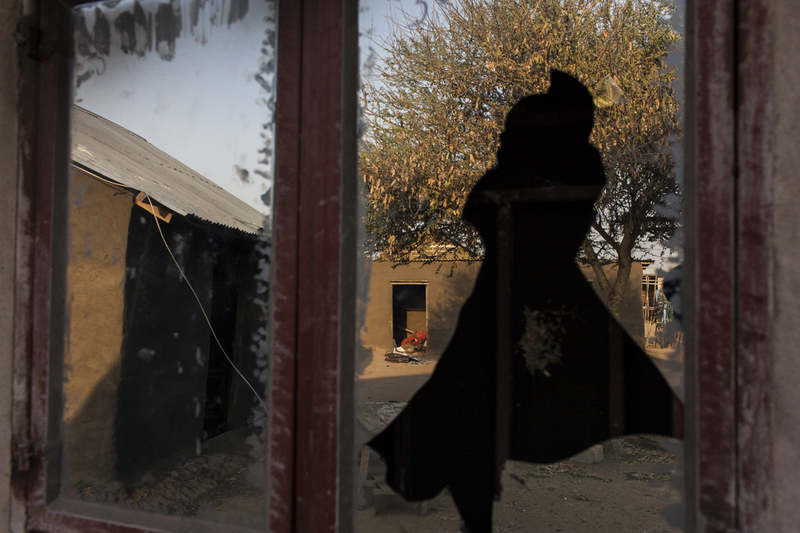 I was told that up to twenty people, hands tied behind their back, had been forced into the hut when SPLA forces opened fire on the men, women and children inside, before setting the home ablaze. The second location was the home of a man name Phar. It was a modern two-bedroom house with a chandelier hanging from the living room ceiling. The walls were covered with a thick black layer of soot after the solders had looted and torched anything of value. 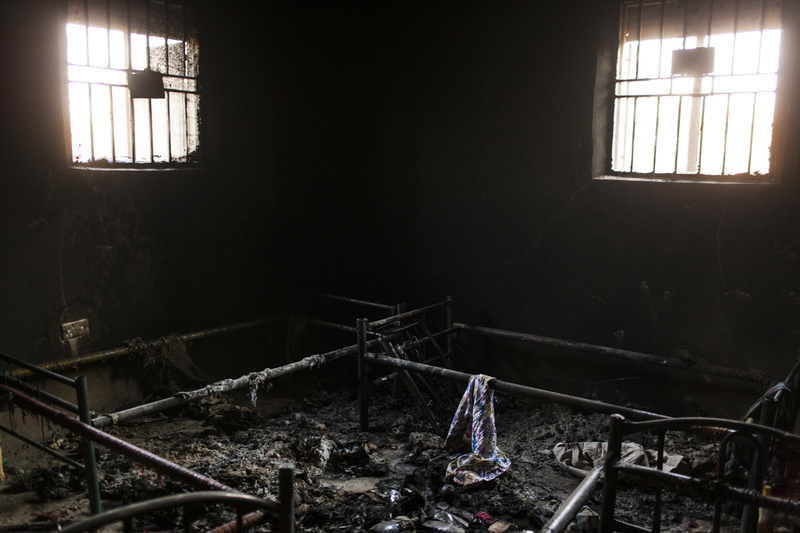 Scorched bedframes which sat amongst piles of charred shoes and clothes were all that remained. I brought the photos back to Phar, who with his family was seeking shelter in the IDP camp in the UN base. Others in the camp confirmed the tukul where they had seen members of the community shot and had heard the last screams from the women and children inside the hut as it burned. 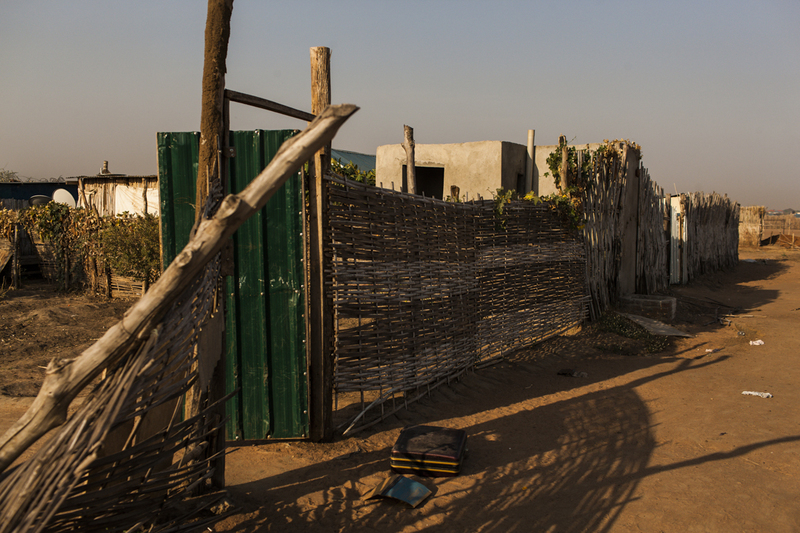 These photos were the first time that the people from Mia Saba had been able to see their ruined neighborhood after fleeing their homes. 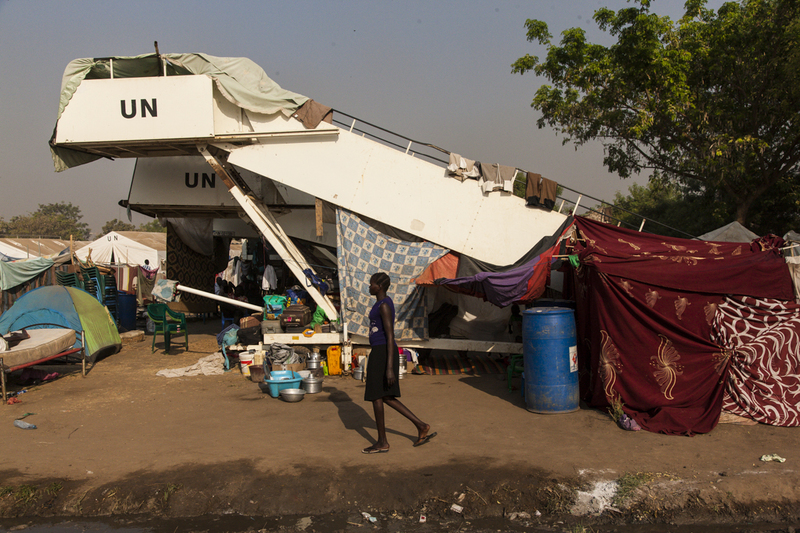 Five months later, Nuer civilians still fear for their lives if they leave the safety of the UN base in Juba. From these first days of violence, a debate has emerged as to whether or not this is a political or ethnic war. During these first few days the killings in Juba targeted specifically Nuer civilians, though multiple and horrific acts of violence and mass killings against Dinka civilians have also been carried out by the Nuer forces throughout the country since December. What remains significant about those first days in Juba is that many in the Nuer community believe that it was on the basis of these initial killings that Salva Kiir lost his right to the presidency of South Sudan, and that the war must continue until he steps down or is forcibly removed from power. Children wait for their mother to return from the market at the IDP camp in the UNMISS compound where more than 25,000 people of the Nuer tribe are seeking refuge in Tong Ping, Juba, South Sudan, January 17, 2014. 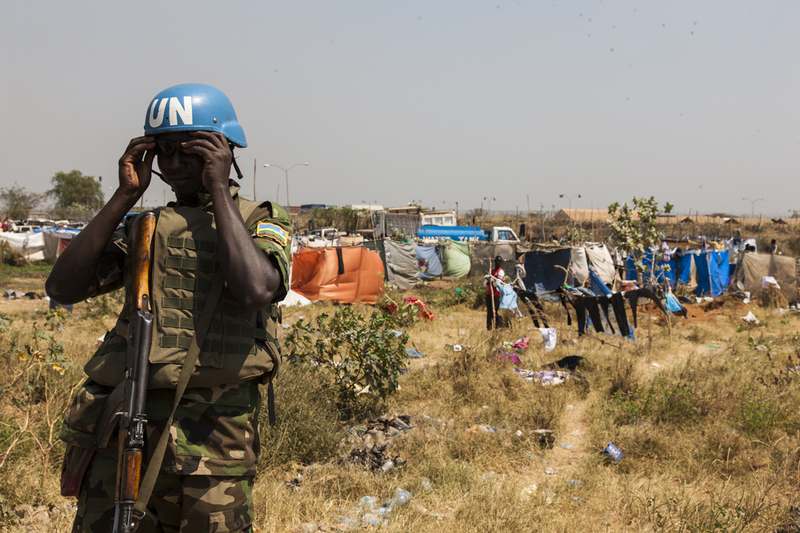 A Rwandan UN peacekeeper puts on his sunglasses while standing guard outside of the IDP camp in the UNMISS compound that now contains more than 25,000 people of the Nuer tribe who are seeking refuge in Tong Ping, Juba, South Sudan, January 17, 2014. Women cook at the IDP camp in the UNMISS compound where more than 25,000 people of the Nuer tribe are seeking refuge in Tong Ping, Juba, South Sudan, January 18, 2014. A woman walks through the IDP camp in the UNMISS compound where more than 25,000 people of the Nuer tribe are seeking refuge in Tong Ping, Juba, South Sudan, January 17, 2014. 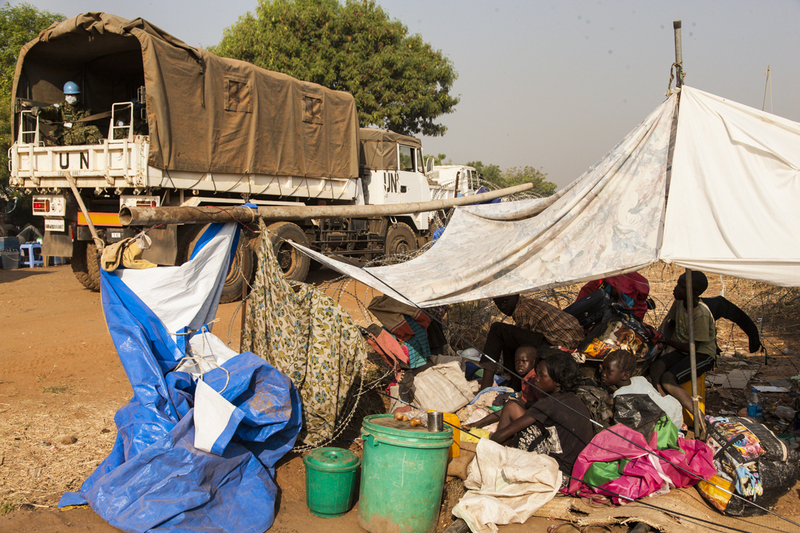 The entire neighborhood has been left abandoned as people fled to the UN compound in Tong Ping and are still fearful to return to their homes only a short distance away in Munuki West in Juba, South Sudan, January 19, 2014. 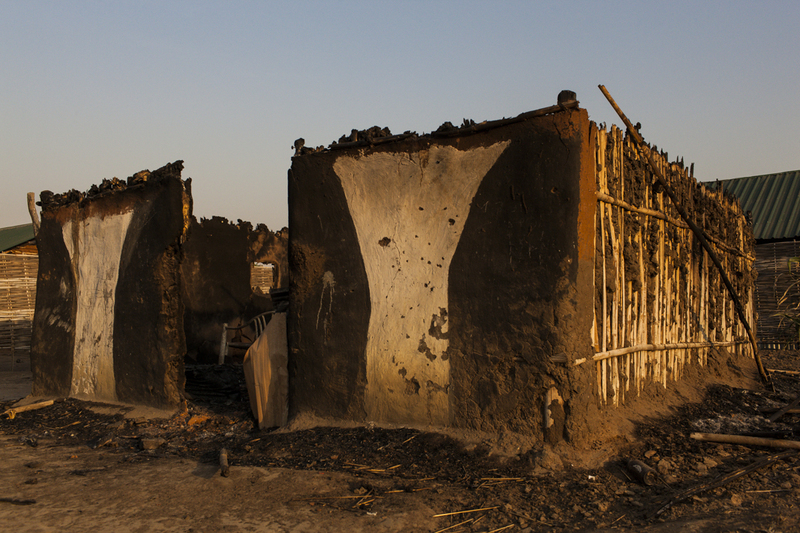 On December 16, SPLA government soldiers from the Dinka tribe filled the tukul with Nuer, opened fire on the civilians and then burned the home in Munuki West, Juba, South Sudan, January 19, 2014. 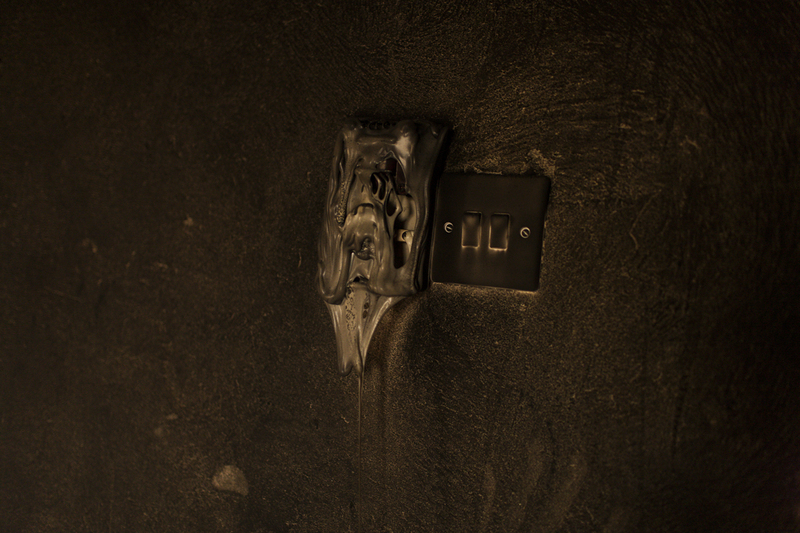 A melted light switch and fingerprints on the soot covered wall of Phar’s house after it was torched by Dinka SPLA government forces on December 16, is seen in Munuki West, Juba, South Sudan, January 19, 2014. On December 16 SPLA government soldiers from the Dinka tribe looted and burned houses in the Juba neighborhood of Munuki West, South Sudan, January 19, 2014. 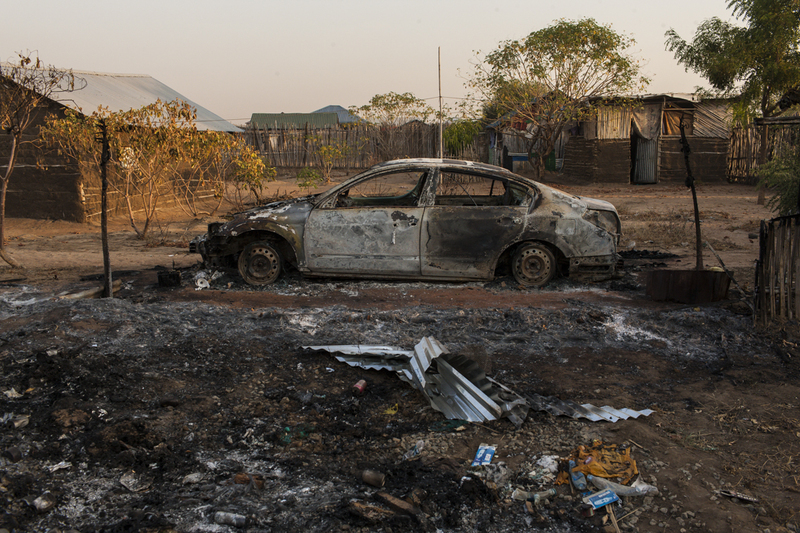 A car that was destroyed by Dinka SPLA government forces on December 16, is seen in the Juba neighborhood of Munuki West, South Sudan, January 19, 2014.